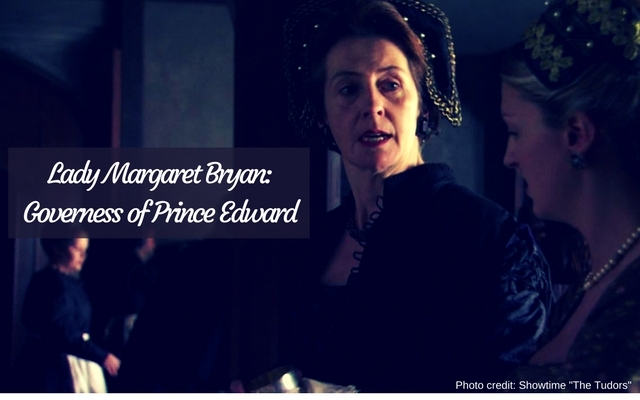 Lady Margaret Bryan is best known as Governess to Princess Mary, Princess Elizabeth and Prince Edward. She was given a very important charge – the care of three future monarchs. In this article we are looking at who Margaret Bryan was and letters from her time as Governess of Prince Edward. Born Margaret Bourchier, about 1468, in Yorkshire, she was the daughter of Elizabeth Tilney and Sir Humphrey Bourchier who was killed at the Battle of Barnet. The Battle of Barnet took place in 1471 and was one of many battles during the Wars of the Roses. Elizabeth Tilney served as a lady-in-waiting to Elizabeth Woodville and later, Lady of the Bedchamber to Elizabeth of York. Margaret was the middle child of her parent’s three children. She had an older brother, John who later became 2nd Baron Berners and a younger sister, Anne who later became Baroness Dacre when she married Thomas Fiennes, Baron Dacre. After her father died in 1471, her mother, Elizabeth Tilney, married Thomas Howard, Earl of Surrey. Because of this marriage Margaret Bourchier became the half-sister of Thomas Howard (future 3rd Duke of Norfolk) upon his birth in 1473 and Elizabeth Howard (mother of Anne Boleyn) when she was born in 1480, among other half-siblings. Sometime before 1490, Margaret wed Sir Thomas Bryan and together they had two children that made it to adulthood: Sir Francis Bryan and Elizabeth Bryan (who married Nicholas Carew). Both Margaret and her husband served Katherine of Aragon at court – Margaret as a lady-in-waiting and Thomas as vice-chamberlain. Surrounded by nobles at court and within her family – Margaret would have been very familiar with the customs, training and etiquette it would take to govern the young royals. As Governess of the future King of England Margaret was responsible for his person. She was to make sure that when visitors arrived that they saw the young prince in all his glory. After my most bounden duty I humbly recommend me unto your good lordship; and according to the king’s grace’s commandment and yours shall accomplish it to the best of my power with such things as here is to do it withal: which is but very bare for such a time. The best coat my lord prince’s grace hath is tinsel, and that he shall have on at that time; he hath never a good jewel to set on his cap; howbeit I shall order all things for my Lord’s honour the best I can, so as I trust the king’s grace shall be contended withal; and also Master Vice-Chamberlain and Master Cofferer I am sure will do the best diligence that lieth in them in all causes. My lord, I thank Jesu my lord prince’s grace is in good health and merry, and his grace is in good health and merry, and his grace hath four teeth; three full out, and the fourth appeareth. And thus fare you well, my own good lord, with as much joy and honor as your noble heart can desire. And I assure your lordship I never saw so goodly a child of his age – so merry, so pleasant, so good and loving countenance, and so earnest an eye, as it were a sage judgemental towards any person that repaireth to his grace; and as it seemeth to me, thanks be to our Lord, his grace increaseth well in the air that he is in, and albeit, a little his grace’s flesh decayeth (he is thinner), yet he shotyth out in length (has grown), and wexith firm and stiff, and can steadfastly stand, and would advance himself to move and go, if they would suffer him, but as me seemeth they do yet best, considering his grace is yet tender, that he should not strain himself, as his own courage would serve him, till he come above a year of age. In the letter, Audley also states that he is glad to hear the King will remove Edward from Havering for the winter for the house will be very cold. The conditions at Havering are much better for the Prince’s health in the summer. 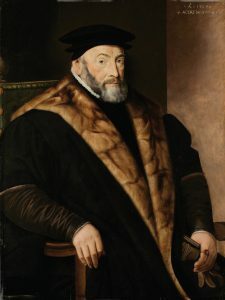 Although Lady Bryan retained the title of lady mistress even after Edward’s succession in 1547, her last years were spent not at court but at her estate in Essex, where she enjoyed a generous annuity of £70 per year. Margaret Bryan writes as a mother would – talking of accomplishments of her young son. 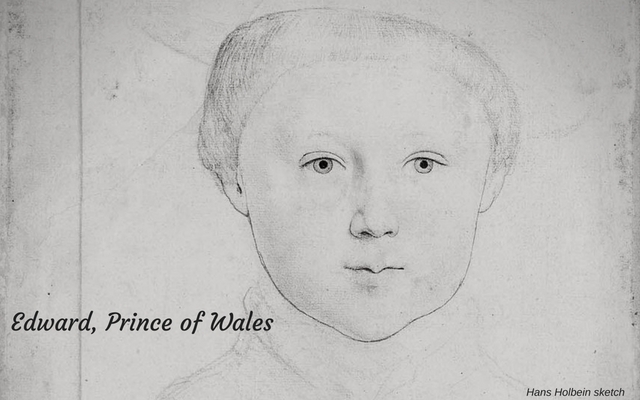 I can imagine that for little Prince Edward that she was the closest thing to a mother that he could recall. Lady Bryan died in 1552, living long enough to see Edward on the throne of England. Through her daughter, Margaret was the great-grandmother of Elizabeth “Bess” Throckmorton, Lady Raleigh, wife to Walter Raleigh and chief lady-in-waiting to Queen Elizabeth I.